All require a well drained but moisture retentive soil, neutral to acid with plenty of humus or leaf mould. These are wonderful woodland plants for a cool soil that never dries out, in dappled shade or ideal for planting beneath deciduous shrubs or trees. 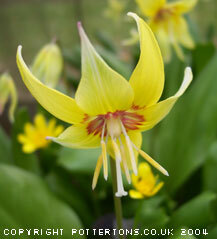 Flowering in March or April, plant the bulbs approximately 7cm deep. 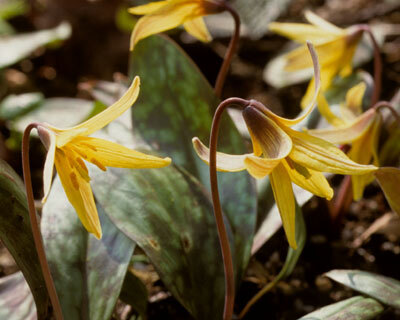 Bright yellow flowers to 10cm, April/May, deep green leaves dotted, marbled violet and white. Naturally smaller bulbs than other species offered. 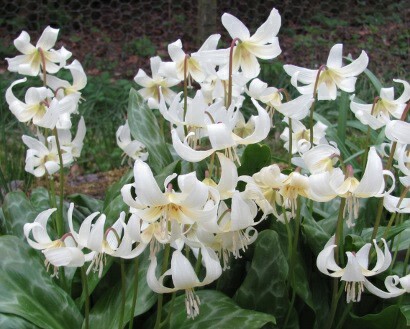 Strong form, numerous large white flowers with yellow centres sit proudly on stems up to 20cm, attractive mottled leaves. 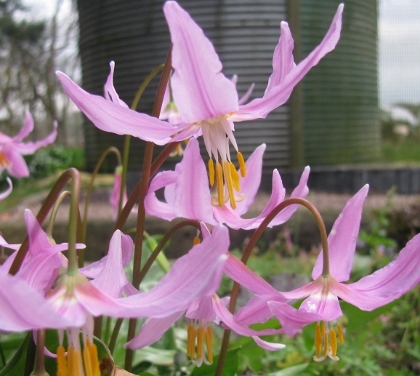 Quite a stunning plant once established which quite quickly increases and forms good clumps. 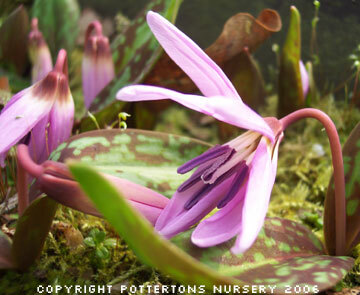 The European Dogs toothed Violet - beautiful marbled leaves and pink flowers on short stems up to 15cm in April. We also offer several named forms selected by flower colour. A fine selected deep pink form with outer petals of purple, greenish-bronze basal spot. A good, large & robust lilac coloured flowering selection. 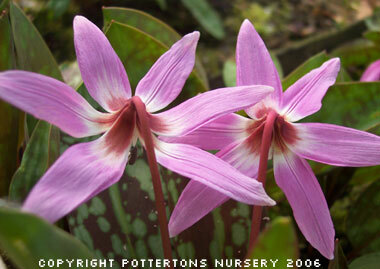 Superb cyclamen-purple flowers, centre marked soft brown with a white margin, a fine leaf form. Lovely rose-pink flowers with attractive mottled leaves. Large white flowers of good substance stand proudly above the marbled leaves. Large white flowers with a yellow-brown centre mark. 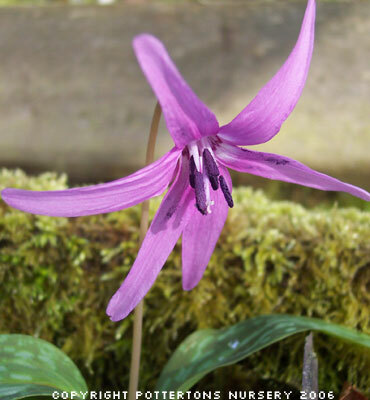 Violet-purple flowers and dark purple anthers up to 15cm but usually less, makes this a most charming and attractive plant for woodland planting - absolutely HATES drying out and must be planted immediateky upon arrival with your order. A native of Japan. A beautiful hybrid between E tuolumnense and E. californicum 'White Beauty', bearing 3 to 4 sulphur-yellow flowers on a 25cm stem in April. Leaves mottled bronze, very hardy. A superior form of E. revolutum with its deep green marble, patterned leaves and short stems of very large, bright pink flowers, large exerted yellow stamens. A strong, long lived plant that grows well in our nursery garden. A very beautiful, eye-catching species with deep golden-yellow flowers flushed red above attractively marbled leaves. Limited availability.